Until recently, there was little interest in gardening for taste but the movement toward edible gardening is now quite strong. No longer are fruits and vegetables relegated to their own beds. They are being integrated into the landscape and, with a few exceptions, are admirable partners to other shrubs, perennials, ornamental grasses, vines, annuals and tropicals. I love the colorful beauty of the stems of Chard ‘Bright Lights’ and grew it last year behind some Euphorbia and in front of mums that wouldn’t bloom until fall. 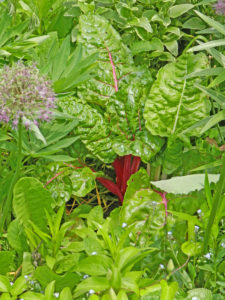 Wonderfully, the chard has remained colorful throughout the winter. 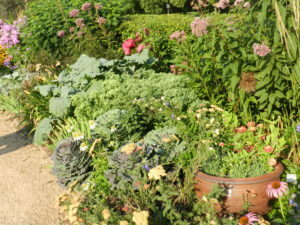 Most of my herbs are planted in mixed containers for their foliage textures and colors. 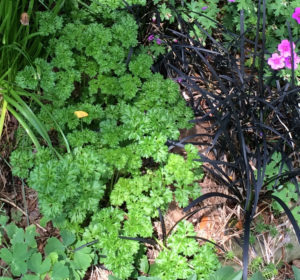 The exception is curly parsley which I plant in the garden as an ornamental because of its unusual texture. It is, of course, often used culinarily (is that a word?) as a garnish but also chopped to add something green to an otherwise bland looking dish. Sometimes I think that growing tomatoes is a lost cause, that I’m better off buying my tomatoes at the farmer’s market. However, I take exception to that statement with cherry tomatoes. Nothing can compare to walking outside and plucking the “cherries” off the vine when they are ripe. 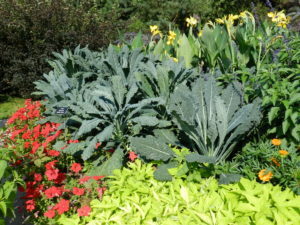 They taste wonderful but they also add color and height to the garden, especially when grown on trellises or obelisks. With so many different cultivars available, the color doesn’t have to be red; it could be yellow, orange, or purple. Kale has become the vegetable du jour. 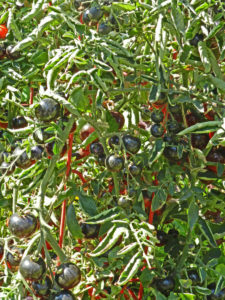 ‘Lacinato’, an Italian heirloom variety, has a pebbly texture and is delicious grilled, chopped, or in soup. It is stunning in the garden and easy to grow. Berried plants have become quite popular – blueberries and raspberries, in particular. 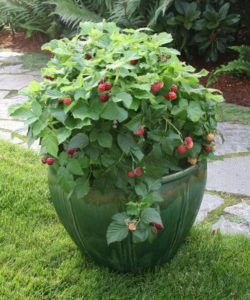 The relatively new brazelberries have been bred for containers. Supposedly the berries are delicious and the fall color of the foliage is quite lovely. Strawberries can be grown in hanging baskets; their maintenance is much easier since you don’t have to corral the runners. Just pluck the berries when they turn that yummy red. What other edibles did you include in your garden this year?